Part of a small chain of boutique cinemas dotted throughout London, all Curzons are a pleasure to visit – their love of film is clear from the vintage posters on the walls. But their latest outpost in usually gloomy Victoria is the best yet. There’s a great bar stocked with all manner of weird and wonderful board games to play while you wait for your film to start. 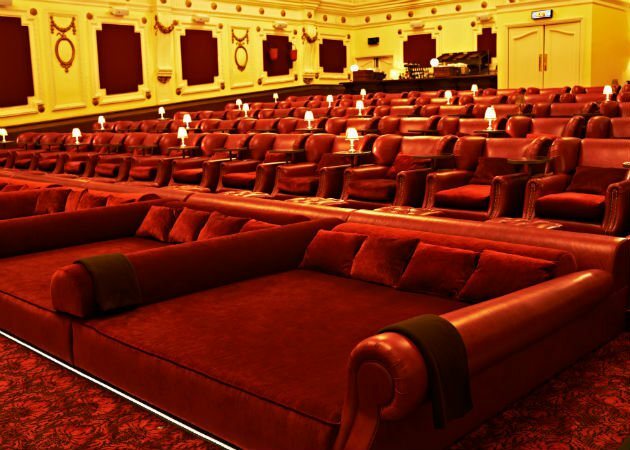 You can then head into the screening room to sit in cosy love seats, perfect for snuggling up in front of the latest blockbuster. You won’t find many current releases showing here. Instead, it is a film lover’s paradise screening the best of classic cinema and the movies you love to hate. From sing-along ‘Frozen’ to Christmas movie marathon all-nighters, this is where you can embrace your inner geek with glee and re-watch some of your favourites for the first time on a big screen (often with the odd celebrity guest joining in the fun). If you’re thinking of sticking around London, their annual membership is only £10 which gets you discounted tickets and priority booking for big events. Get the feeling of watching a film from the comfort of your own home by relaxing in lush armchairs or go all out and book one of the Electric’s double bed seats for ultimate luxury. Don’t worry about your drinks getting warm with the built in wine coolers next to each seat, and if you’re feeling peckish part way through the film, you can opt to have snacks delivered straight to you by the extremely attentive staff at any point. It’s not often that you’ll hear me recommending a nationwide cinema chain (a bog standard cinema in Leicester Square will set you back nearly £20), but with The Lounge, Odeon have got it so very right. Go ahead and order a sublime three-course meal to eat at your seat, all complete with tables and crockery that don’t clang together and annoy your neighbours. Even better, you can be safe in the knowledge of a quiet viewing as this cinema is strictly for adults only. Charlie is a UK lifestyle blogger based in London, showcasing things to do, awesome things to wear, and delicious things to eat! Next Beat The Heat in DC!